Polish Pottery Deep Bowl w/Handles. When the occasion calls for grand presentation, turn to this oversized Polish Pottery Salad bowl for impeccable service. Or use this large stoneware bowl for mixing. This bowl is beautifully decorated both inside and out and makes a stunning centerpiece. 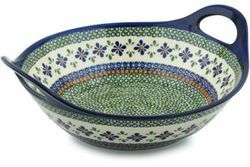 A great compliment to your polish pottery dinnerware set.